This tunnel green house is designed to protect your flowers and lovely plants from harsh weather conditions including rain, wind, and snow. Its high-quality, portable design will allow you to grow and maintain a beautiful garden in countless locations. The easily-assembled green house is composed of a PE mesh cover with rust-resistant steel frame. Your garden will not only benefit from sunshine; it will also breathe fresh air in its new spacious home. Take care of your plants in the best environment possible, year round. 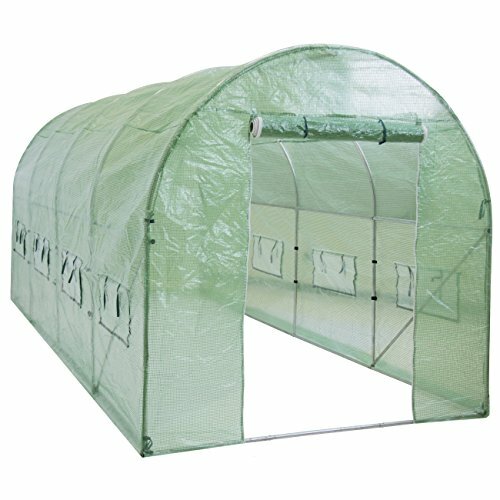 Durable plastic cover of this greenhouse ensures all your plants are protected from rough weather conditions such as rain, wind, and snow. Create your very own indoor garden with its tall, spacious interior. Walk-in door gives you easy access. Room to add a multitude of new plants without compromising the amount of space needed to grow to their full potential. Strategic 3-tier design includes shelving on both the left and right side. Different heights between the spaces allow for storage of small and large plants side-by-side. Helps to keep plants safe and organized. High-grade, powder-coated steel tube frame and heavy-duty cover are accompanied by guy ropes and ground stakes to maintain stability. Easily set up or dismantled green house to be moved to an area of your choice, indoors or out.